Classic Pandemic gameplay with a horrific twist! Over 10 Old Ones with unique powers! Beings of ancient evil, known as Old Ones, are threatening to break out of their cosmic prison and awake into the world. Everything you know and love could be destroyed by chaos and madness. Can you and your fellow investigators manage to find and seal every portal in time? Hurry before you lose yourself to insanity. 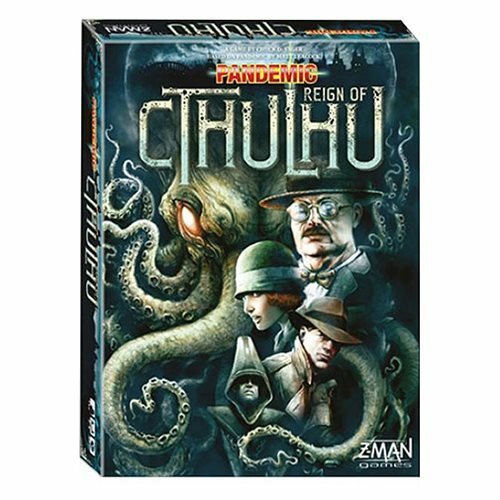 The Pandemic Reign of Cthulhu Board Game is sure to provide countless hours of fun. For 2 to 4 players. Game time runs approximately 40 minutes. Ages 14 and up.